Bars below access other Sections, this site. Bars below access Web Sites. 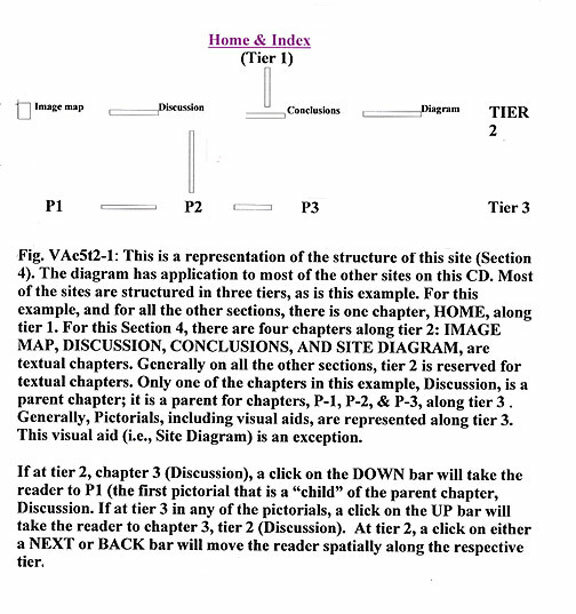 Note: There are 2 site diagrams: Site Diagram 1 and Site Diagram 2. This section is structured in 3 tiers. Tier 1 is Home - a single chapter (C1). There are 2 chapters along tier 2 (C2 & C3). Chapter 3 is a parent chapter for 2 “children” chapters along tier 3. Bars of the first cluster in the Masterborder are of primary type; primary bars provides access to chapters of this section. The next cluster in the Masterborder is composed of secondary bars (identified by a colored sphere); secondary bars in the Masterborder and at the end of each page provide access to other sections and to web pages. Up, Down, Next, and Back bars are present at the end of each page. Reaction patterns are occasionally sufficiently distinctive to provide the basis for a specific diagnosis. The patterns of secondary lues are an example. The basic pattern is that of a primary lichenoid reaction of cell-rich type. In a cell-rich lichenoid reaction, the inflammatory cells affect the basal layer or the functioning basal unit of the epidermis. The inflammatory cells intermingle among keratinocytes and are associated with widened spaces among the cells. The pattern somewhat resembles spongiosis but there are more lymphoid cells per unit area and the reaction is more diffuse at the dermal-epidermal interface. Spongiosis is generally spotty in distribution. A dermal papilla and the overlying epidermis will be affected and several adjacent dermal papillae are likely to be unaffected. The basal unit is poorly adapted to resist the effects of a cell-rich lichenoid reaction. Cells of the basal layer degenerate and undergo lysis. There is accelerated apoptosis and perhaps a corresponding reduction in regeneration of basal keratinocytes. As a result, the basal unit undergoes atrophy and the interface becomes straight. Initially, the superficial unit is slow to respond to the damaged basal unit. There may be immuno-stimulation initially. Cells may be delivered to the superficial unit more rapidly and keratinization in turn becomes altered. Keratinocytes fail to complete the process of keratinization and nucleated cells are delivered to the keratin layer. This form of keratinization is a poor barrier at the surface and irritants along the skin surface as well as altered metabolites related to altered keratinization evoke a migration of neutrophils into the epidermis. They collect in the keratin layer. The resulting patterns have a psoriasiform quality. The increase in the turnover of cells in the epidermis interferes with the closure of the interstitial avenues of the superficial unit. Lymphocytes and histiocytes can then find their way out of the basal unit into the superficial unit and the lichenoid reaction can also affect cells of the superficial unit. Such a migration is common in lesions of pityriasis lichenoides; it thus becomes a pityriasic quality. A lesion, if biopsied at this stage, shows features of a primary lichenoid reaction even if the patterns are also psoriasiform. The combination can be compared to the reaction early on in a lesion of pityriasis lichenoides and as a model, qualifies as a pityriasic reaction pattern of lichenoid (as opposed to spongiotic) type. The superficial unit of the epidermis is well-suited to resist the effects of a cell-rich lichenoid reaction. Simply, the ability to close the epidermal interstitium, once the adaptation to injury has been made, denies lymphoid cells access to the intercellular spaces; no direct contact, no harm. In response to a damaged basal unit, the superficial unit compensates by slowing the process of keratinization and delaying the delivery of dead cells to the surface. Keratinization becomes accentuated. Eventually, the epidermis comes to resemble a hypertrophied superficial unit with a damaged basal unit consisting mostly of a single row of hypertrophied basal cells. This pattern is that of an established lichenoid reaction and the reaction in lichen planus is prototypic. With modifications, the pattern may also be encountered in the setting of pityriasis lichenoides but is seldom emphasized. Finally, the lymphoid infiltrates regress and the end-result is a thin epidermis with a poorly developed basal unit and a straight interface. In addition, the papillary dermis is widened and fibrotic. Vessels of the papillary dermis are dilated. The pattern is poikilodermatous and qualifies as a senescent lichenoid reaction. The patterns describe the life history of a lesion of pityriasis lichenoides but generally the primary pattern is given emphasis. With such emphasis, a lesion sharing features with the primary stage of a lesion of pityriasis lichenoides might be spoken of as a pityriasic disorder. The pattern in an early lesion of secondary lues is of pityriasic type. It is a primary lichenoid reaction of pityriasic type but is distinguished by the presence of plasma cells and by a component of histiocytes that is even greater than that seen in pityriasis lichenoides. The epidermal and dermal histiocytic response often is sufficiently developed to provide granulomatous qualities to the pattern. Like pityriasis lichenoides, lesions of secondary lues have a life-history which includes primary, established, and senescent stages. These variations must be among the virtual images evoked in an effort to interpret the variable changes encountered when interpreting lesions of secondary lues. The high component of migratory histiocytes in the epidermis in 2nd lues probably is a response to the presence of spirochetes in the epidermis. The pityriasic disorders in contrast to the lichen planus-like disorders are lichenoid lymphocytic vasculitides. There are prominent perivenular components in the reticular dermis. In the lichen planus-like disorders, perivenular components are less conspicuous. The patient was HIV+. This alteration in immune status apparently alters the response of the patient to therapy. There is less likelihood of an allergic response to energetic treatment. The patient has to get better to be at risk for an allergic response to treatment. Perhaps, the prominence of transformed lymphocytes in the inflammatory infiltrates and the scattered mitotic figures are also expressions of altered immunity in the HIV+ patient. Click on LEGENDS to go to the clinical illustrations. Bars to left access other Sections, this Site. Web sites above Other sections above Other chapters, this Section (above).